TOP PAGE | AOYOSHI CO., LTD. In 2016, AOYOSHI CO., LTD. has welcomed its 60th year of excellence since establishing the company in Tsubame City, Nigata Prefecture of Japan, and region famous for its tableware and cutlery tradition. Tsubame city, where we continue to call our home, has flourished with metal processing as its main local industry and central hub of Japan since 300 years ago. To this day, the exceptional skill is being passed down to many dedicated craftsmen in the region. At AOYOSHI, we are currently operating our original "CASUAL PRODUCT" brand, engaging in planning, production and sales distribution. CASUAL PRODUCT is a household goods brand, mainly offering kitchen goods and tableware. The brand name was borne from our aspiration for customers to have fun when selecting home appliances, including houseware and tableware, as you would in fashion. We work daily with a commitment to develop & deliver innovative designs for our customers. Recently released VINTAGE SERIES is absolutely a new concept product line. We have processed our stainless tableware, cutlery & bar utensils with an original surface finish, and although the products are brand new, each product has character and expression commonly attributed to things that have been around since the heyday of our grandparents. The user will have a fond affection to these products. The name VINTAGE is rooted in our desire for customers to experience high-quality feel and comfort as if nurtured through many years of use, like your favorite vintage pair of denim jeans, transcending time with its fine quality. Today, vintage taste coupled with a sense of nostalgia and familiarity is sought after in fashion, music, cars and various other necessities of life. 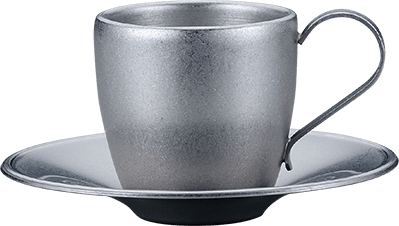 Having this generational backdrop, we want to develop stainless steel tableware with VINTAGE feel as well, the fundamental concept of CASUAL PRODUCT VINTAGE SERIES. Conventionally, stainless steel products will have finishing that gives a mirror like shine or matted quality. In contrast, we reversed the "polishing" technology and concept to give our VINTAGE SERIES a rough character with chips and scratches. This particular method is the world’s first and we call it the VINTAGE Finish. The technology has already been granted a patent, and it was a damaged pair of jeans that gave us the innovative idea of scratching the surface of stainless steel. The trial began from a curiosity that wondered what would happen if the same process for damaging jeans was applied to the surface of stainless steel. The test began on small cutleries and today we are able to apply the VINTAGE Finish on plates, small or large, allowing us a wide range of product options for the VINTAGE series. VINTAGE SERIES will have minimal scratches and rough surface. Although brand new, this feature creates warmth commonly attributed to long-used goods, a quality that delivers nostalgia like feel. A masterpiece that grabs your affection as soon as it is held in the hands for the first time. The pleasantness of use that VINTAGE SERIES deliver is its other unique feature. Take the coffee cup for instance. 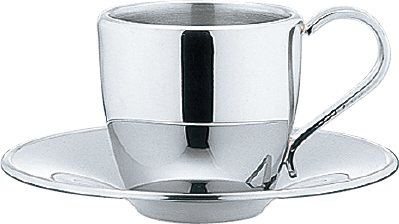 In addition to quickly noticing the good-fit and weight in your hands, sharpness from the edge of the cup is discarded, left with only a smooth texture. This textural quality eliminates any coldness or uncomfortableness, common features felt in ordinary stainless steel products, but in contrast, you will notice a smooth and moist texture when lips touch the edge of our VINTAGE SERIES coffee cup. 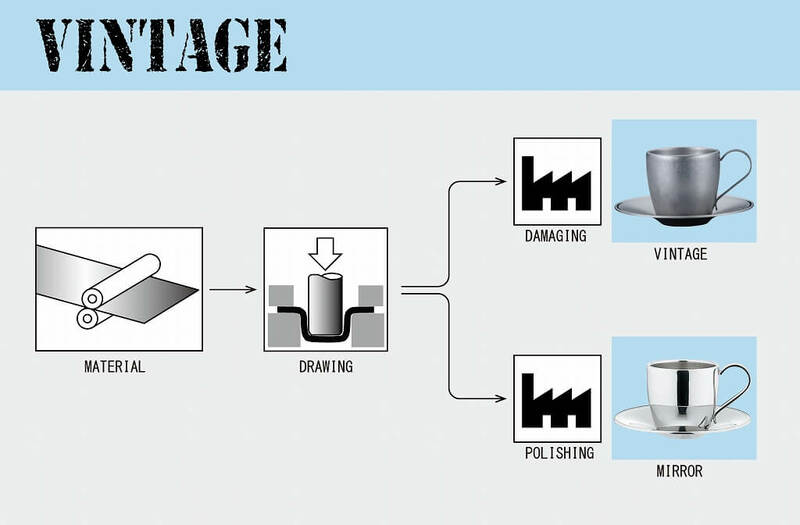 This is the workflow for creating our mirror finished Double-walled Coffee Cup and VINTAGE products. The process of shaping the product is the same but from that point on the process breaks apart into two distinct methods, polishing until it shines like a mirror and the other is applying the VINTAGE finish. The mirror finished products shine like a mirror and even with its simplicity, high-class and elegance is intact. Although the VINTAGE finish does not provide a shiny finish, it has a distinct warm textural quality. It took many years to achieve our highest level of metal processing technology, which in turn gave birth to our innovative and world’s first stainless steel processing technology that ultimately introduced the VINTAGE SERIES with distinctive quality and feel. It’s new, but you longed for its familiarity. The feel of wear from long use is uniquely expressed in each product. Currently, the brand offers over 200 items, and to match the ambiance of the VINTAGE SERIES products, wooden mats are available as well. We will continue to innovate new products to further enrich the brand. We aspire for many customers to experience the unique textural quality of the VINTAGE SERIES to add some joy to your precious time. We are introducing new products by maximizing our production technology while being conscious of the products’ pleasantness of use and the beauty of its silhouette and lines. In recent years, we have had the great opportunity to exhibit in overseas trade shows, namely Maison et Objet and NYNOW, to display our VINTAGE SERIES, and had the chance for business meetings that resulted in many orders. In the future, we will continue to introduce Japan’s creative gems and our company’s original products to the global market. © 2019 AOYOSHI CO., LTD. All Rights Reserved.